First time I tried these crispy lotus root chips I was hooked! So now I have to order one serving with every meal at Kyoto Cafe in Eastland. The moment you step foot in the restaurant, you are greeted by friendly Japanese staff with "irasshaimase" and a slight bow! Making you feel very welcome! 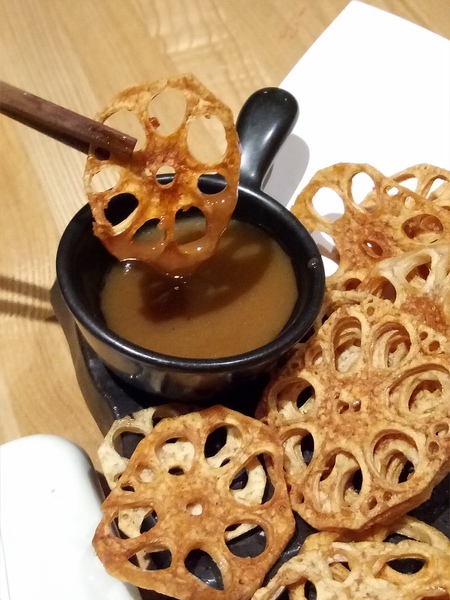 These Japanese restaurant-style salted and crunchy lotus root chips are a delicious alternative to kale, potato, or sweet potato chips. Kyoto cafe brings a traditional authentic taste of Japan, inspired by Kyoto's traditional Japanese Tea Ceremony, the most classic way to experience the Japanese spirit of hospitality. The cafe serves a wide selection of traditional Japanese dishes, sweets, and breakfast on weekends. It caters to a variety of occasions and you can experience an authentic matcha tea ceremony!